Gail Caltride, teacher at Notre Dame Preparatory School, and Sister Kathy Schmittgens, the international SSND Shalom coordinator, discuss their experiences from the first week of the U.N. Commission on the Status of Women. 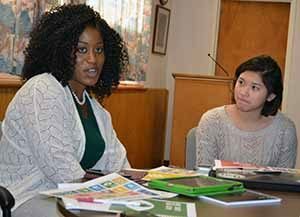 Christiana Showunmi discusses the Sustainable Development Goals as Micah Castelo listens during an orientation session for the NDMU students attending the UN CSW. 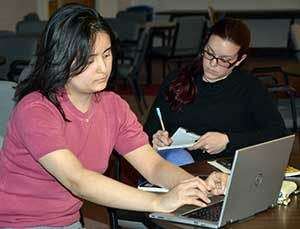 Kelly Tandan and Hillary Flowers spend time journaling about their hopes for the week and how they might challenge themselves at the United Nations. Seven students and a professor from Notre Dame of Maryland University in Baltimore have joined the School Sisters of Notre Dame delegation for the second week of meetings at the United Nations Commission on the Status of Women. They will be advocating on issues of concern to women and girls and attending seminars, panels, workshops and discussions just as the the high school students did with the SSND delegation during the first week of the CSW. The 17 Sustainable Development Goals are particularly relevant to SSNDs because they intend to end poverty, protect the planet and ensure prosperity for all. As a registered Non-Governmental Organization (NGO), the School Sisters of Notre Dame have a responsibility on the global level to educate and advocate on such issues of concern. The CSW agenda for the coming week includes side events and parallel events on a diverse array of topics, including Women’s Economic Empowerment in a Humanitarian Context; Gender-based Violence, Health and Wellbeing; Gender Equality as an Accelerator for Achieving Sustainable Development; Exploring Primary and Secondary Education in a Developmental Context; Empowering Women Survivors of Slavery; and Water and Women’s Economic Empowerment. 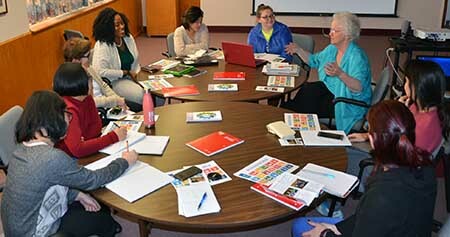 Sister Eileen Reilly discusses the United Nations Commission on the Status of Women meeting with the students from Notre Dame of Maryland University.